As an Administrative Assistant in the Student Services Department, Margaret helps process students’ paperwork both during their application and after their admission to Dallas International. She also performs tasks for the Registrar’s Office and the Alumni Office. 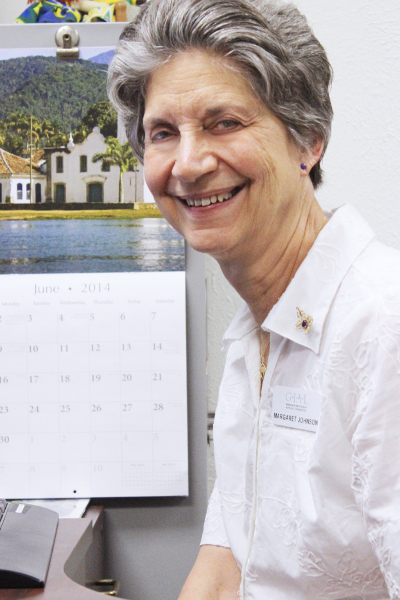 Before joining the Dallas International staff in 2009, Margaret served in Rio de Janeiro, Brazil, for forty years through the International Mission Board (IMB). While there, she acquired extensive experience through a variety of positions. After a year of language school in Campinas, São Paulo, Brazil, she worked for seven years as the secretary to the All-Brazil Treasurer. Then, for twenty-five years, she served as a theological education teacher at the Baptist Institute of Religious Education as well as at South Brazil Baptist Theological Seminary. During her last seven years, she coordinated classes in one of the more than one thousand hillside shantytowns in Rio de Janeiro, providing a variety of activities and Bible study. Following this time overseas, she returned to her hometown of Arlington and wanted to remain involved in ministry. The Lord provided her the opportunity to volunteer at Dallas International, where she now devotes her time to helping with documents for students preparing for cross-cultural work. One of her favorite foods from Brazil is “pão de queijo” (cheese bread). She has visited 21 of Brazil’s 27 states. She enjoys listening to instrumental music—hymn arrangements as well as classical and semi-classical compositions. When asked what advice she would like to give, Margaret shared that the only way to true happiness is to follow God’s will step-by-step throughout life. He will not reveal step two until we have taken step one. Reflecting on what God has done in her life, Margaret is both grateful for and amazed by His goodness.